We are happy to announce a ​​free version of CloudAhoy. CloudAhoy Free is a subset of our full-featured debrief product. The full-featured product, including the debrief and sharing capability, is now called CloudAhoy Standard. Check this for a feature list of the two products. 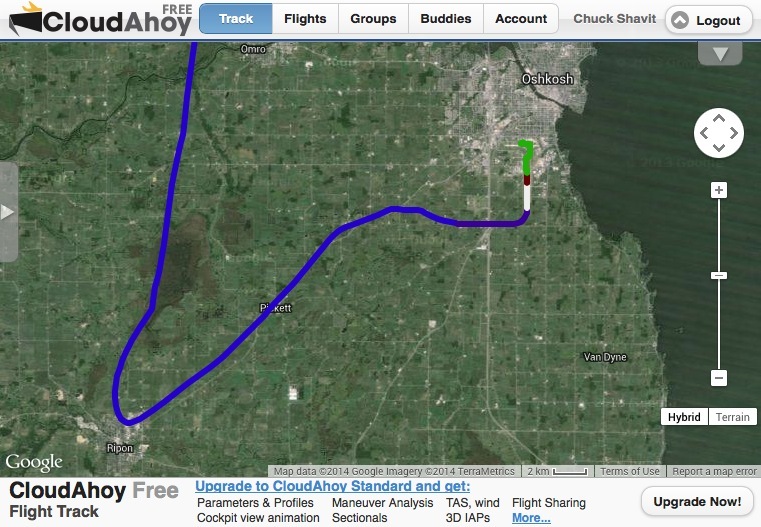 Flights’ tracks (“breadcrumbs”) is the new free feature – in addition to flight logging, and secure web-based access. And just like CloudAhoy Standard, CloudAhoy Free automatically identifies airports and runways, computes the exact wheels-up/down times, and auto-segments the flight track with color coding. Every CloudAhoy account becomes automatically a CloudAhoy Free account at the expiration of the free trial, unless of course you buy a subscription for CloudAhoy Standard. So – if you have a CloudAhoy account and you are not a CloudAhoy subscriber, we invite you to use CloudAhoy Free, and hope that you find it a great way to log and view your flights’ tracks. Upon upgrading to CloudAhoy Standard, you may debrief and share all your past flights including those logged with CloudAhoy Free. Click here to signup to CloudAhoy.